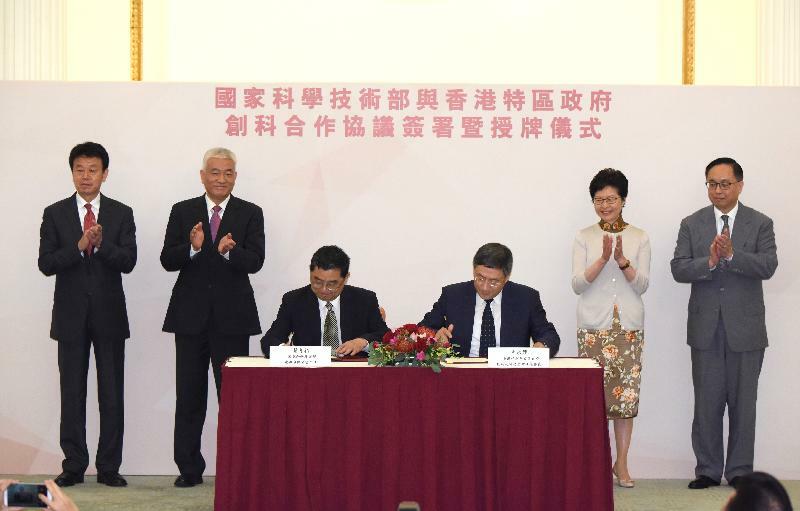 The Chief Executive, Mrs Carrie Lam, and the Minister of Science and Technology, Mr Wang Zhigang, witnessed today (September 20) the signing of the "Arrangement on Enhancing Innovation and Technology (I&T) Cooperation between the Mainland and Hong Kong" and the "Agreement on Commencing Jointly Funded Projects between the Ministry of Science and Technology (MOST) and the Innovation and Technology Bureau of the Hong Kong Special Administrative Region (HKSAR) Government". The Secretary for Innovation and Technology, Mr Nicholas W Yang, and the Vice Minister of Science and Technology, Mr Zhang Jianguo, represented Hong Kong and the Mainland respectively to sign the Arrangement, whereas the Permanent Secretary for Innovation and Technology, Mr Cheuk Wing-hing, and the Director-General of the Office of Hong Kong, Macao and Taiwan Affairs of MOST, Mr Ye Dongbai, represented the two places respectively to sign the Agreement. The Commissioner for Innovation and Technology, Ms Annie Choi, was also present at the signing ceremony. This was followed by a plaque presentation ceremony by the Minister of Science and Technology, Mr Wang Zhigang. From today onwards, the 16 Partner State Key Laboratories in Hong Kong will be renamed as State Key Laboratories, which allows them more flexibility to collaborate with different research and development institutions. At the ceremony, MOST announced that it would entrust SenseTime Group Limited to establish the "National Open Innovation Platform for Next Generation Artificial Intelligence on Intelligent Vision". In her speech, Mrs Lam expressed her heartfelt thanks to MOST for its unfailing support for I&T development in Hong Kong. 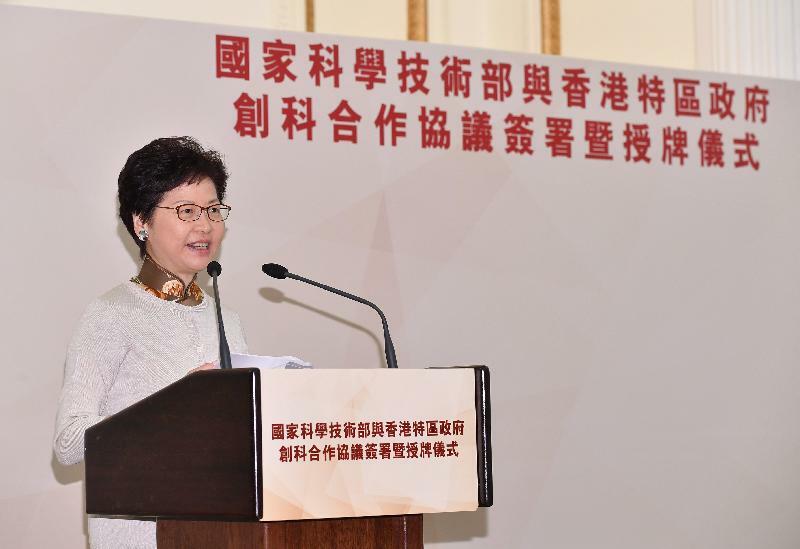 She said, "The Arrangement and the Agreement signed today mark a new page of scientific and technological collaboration between the Mainland and Hong Kong. 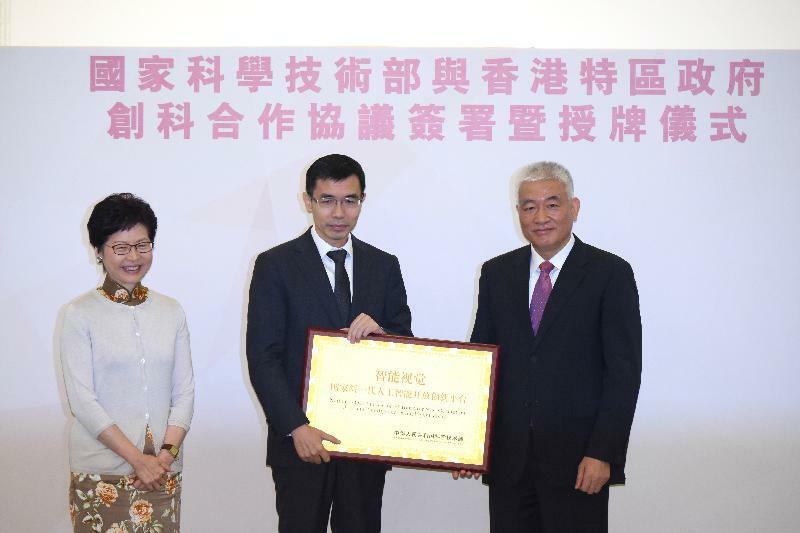 The presentation of plaques to State Key Laboratories is also of great significance, as this would provide more flexibility for the collaboration between the State Key Laboratories of Hong Kong and the research institutes in the Mainland. It also means solid support and recognition. "Moreover, the recognition given to our home-grown unicorn by MOST in moving forward the national development and planning for the next generation artificial intelligence is also a vote of confidence in Hong Kong's strengths in I&T." The Arrangement and its annex "Joint Action Plan on Mainland and Hong Kong I&T Collaboration" will serve as an action guide and framework for the two parties to take forward the various I&T co-operation initiatives in the coming few years. The two sides will enhance co-operation in essentially six areas, namely scientific research, development of platforms, nurturing of talents, transfer of results and incubation of I&T industry, integration into national development strategies, and cultivation of an I&T atmosphere. With a view to encouraging collaboration between Hong Kong and provinces of the Mainland in the area of scientific research, the Government has been exploring with MOST the feasibility of setting up the Mainland-Hong Kong Joint Funding Scheme to support such collaboration. The Agreement sets out the framework of the funding and the modus operandi of the Scheme, details of which will be announced in due course. Founded in 2014 by a number of local scholars, the home-grown SenseTime Group Limited has emerged as China's biggest artificial intelligence unicorn in just a few years' time. Recognising the leading position of SenseTime Group Limited in artificial intelligence, especially intelligent vision, MOST entrusted SenseTime Group Limited to establish the "National Open Innovation Platform for Next Generation Artificial Intelligence on Intelligent Vision" and participate in the nation's development of the next generation of artificial intelligence. State Key Laboratories are a vital component of the national I&T system. High-quality research teams and advanced research equipment are prerequisites for the establishment of State Key Laboratories. 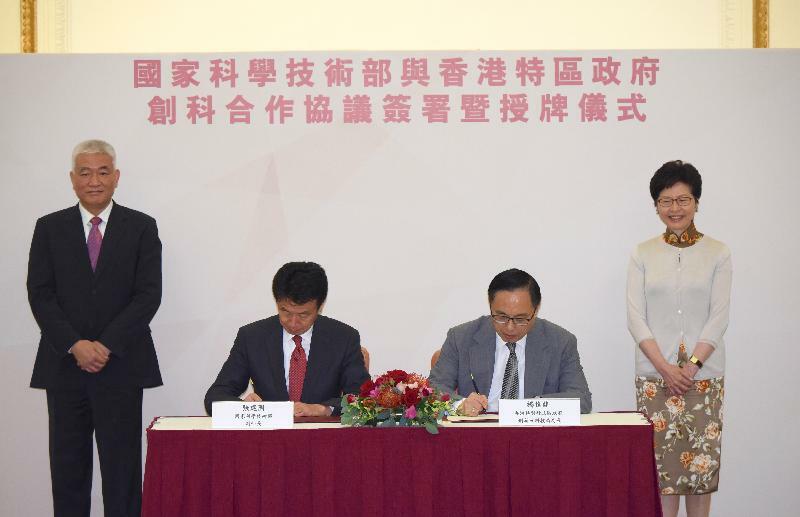 MOST approved earlier the establishment of 16 Partner State Key Laboratories in Hong Kong, which had to partner and enter into co-operation agreements with State Key Laboratories in similar scientific research areas in the Mainland. After adjustment, these 16 Partner State Key Laboratories will be officially renamed as State Key Laboratories. The Chief Executive, accompanied by Mr Yang; the Secretary for Constitutional and Mainland Affairs, Mr Patrick Nip; and the Director of the Chief Executive's Office, Mr Chan Kwok-ki, met with Mr Wang at Government House before the ceremony. 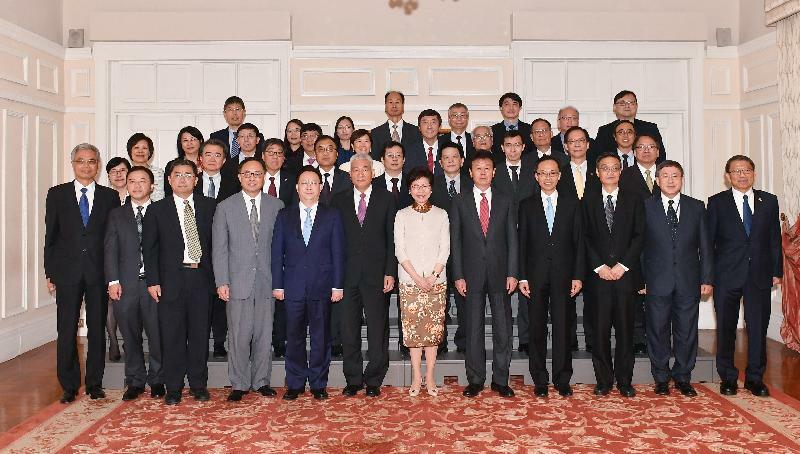 After the ceremony, the Chief Executive hosted a lunch at Government House for guests attending the signing and plaque presentation ceremony, including Vice-chancellors of Universities, academicians of the Chinese Academy of Sciences and the Chinese Academy of Engineering, and representatives of local research and development institutions.